Notes from A Cottage Industry: How'd I do that? A chalkboard art tutrial, sorta kinda. So, I did up a chalkboard easel to share all of the engine details about Old Blue at car shows, and a few people wrote to me, wanting to know how I did it. First of all, it looks like I chalked it on there, but it is really white paint. I used the same method I have been using for about twelve years now, which is detailed in a very old blogpost here. If you click on the links, you will find the "How-To's" for making your own sign. Today I wanted to share the fonts I used, which look great when wanting a "chalked" look paint job on a board, sign or framed art. **EDITED TO ADD: These are PAINTING techniques, and not chalk techniques. You can do the chalk portion and then clean up the chalk dust shadowing and use it that way, but my sign on the easel was made to be permanent, so I used regular latex white paint. Any craft paint will do! There you have it.The fonts were all free, so go grab 'em....easy, peasy. Do you have any other favorite "chalkboard" type fonts? Please share! If you want instant decorating gratification, frame out a window. I have never fancied myself a carpenter. I can paint furniture, and do any sort of paper crafty-ish project, and I can bake a wicked dessert, but using power tools, and slinging a hammer? I couldn't imagine it, nor did I feel even the teensiest bit of interest in this. Then I moved into a 1952 fixer-upper cottage. And I realized I needed to do quite a lot of updating that clearly would require carpentry work. And, hiring it out would do ca-razy insane things to my budget. That's when my daughter, handiwoman extraordinaire, stepped in and assured me that I could do this. Really. I said I would be the judge of that. She came over, chop-saw and nail-gun in hand, and we did a walk through my gonna-be-so-cute-and-cozy cottage. In the end, we decided the bathroom window would be the project I would cut my carpenter teeth on, so to speak. My mama-of-FOUR-BOYS-tape-measure-toting-carpenter daughter whipped out her trusty crowbar, and showed me just how easy it is to pop off a window frame from 1952. We then headed to Home Depot, picked up the wood trim, and got to work measuring the window. Measure twice (or four or five times, if need-be.) and cut once. We set up the chop-saw on the garage floor, and jerry-rigged a way to keep the wood straight while cutting (If you try this, do as I say, and not as I did...) because my work bench is still covered in tubs of holiday items from my move last December. She had me watch her work the saw. Then, she had me work the saw. Oh my. How fun was this?! A whole new creative frontier. Fast, clean cuts. The smell of freshly made sawdust. Instant gratification. Oh yes, I could get used to doing this. The nail gun proved to be even more fun. ...start to finish, we had nailed up and framed my sweet lil' bathroom window, without breaking a sweat. All that is left is to touch up the seams and nail holes with caulk, and paint. (and spend a good amount of time outside with a razorblade, scraping off the sloppy extra paint on the windows from a paint job a couple decades ago.) and the job is complete. Step aside Bob Vila'. Gramma Cupcake's gat a nail gun, and she's not afraid to use it. My daughter and I stumbled upon eight of these ginormous framed and matted prints at Salvation Army a couple of weeks ago, priced at $15.00 each. (They must have been from a hotel or something...?) It was supposed to be a half off day, and when we arrived at opening time, they had changed the sign. So, we didn't buy them. A few days later when half off day finally did arrive she went back and miraculously, they were still there! She got them all, and I bought two of them from her. I reinvented the first one last week, and I was very happy with the way it turned out. I used my signature old book pages as a matt behind the chalkboard print I designed and printed on my computer. The longest part of the entire project was getting the matt and old print out of the frame, 'coz they had used some serious tape all around the back, as well as those little tacks holding the matt board in place. I was completely thrilled with the outcome, and if we had room on awall here at home, I would replace the smaller framed copy of that quote that I have in our entryway now. Instead, I took it down to my case at Camas Antiques, and it will find a place in someone else's home. Next time you're out thrifting, look a little closer at the frame and matt job on pictures, and you just might find yourself a treasure in the making. Love me till my heart stops. You know, I think it's rather hard to find the right thing to hang above a bed. Coming from California,(earthquake country) shelves with lots of little trinkets kind of freak me out, and artwork sometimes looks too busy for my taste, so what's left? At the risk of having one too many signs, or framed quotes in the house, I decided to recycle an old folk art piece. The frame was exactly the size I was after. I printed my quote on my cheesey little Printshop program, using old dictionary pages, then I taped them together to make the size I needed. I used the glass from the frame as my guide to cut the quote out, and put it all together. In less than 10 minutes I had it printed, assembled, and hung above the bed. What do you have hanging above your bed? (Shameless Gramma post, masquerading as...) Photography tips from an amateur picture-taker. We spent last weekend in the biggest little city, seeing friends, my son and daughter-in-law,and those two precious grand babes! My daughter-in-law had the great idea to have me take some pictures of the family at a nearby park that has an old historic one room schoolhouse. That old schoolhouse turned out to be a perfect backdrop for our photo shoot. Now, I do not claim to be any sort of expert on photographing people, but I think I do okay with posed shots. I have a Mac, and I use iPhoto to edit my pictures sometimes, or I use PicMonkey, which is a very easy to use free photo editing site. If the backgound is too busy, it seems to take away from the main focus of the picture. The simple lines of the old doors on the schoolhouse and the white siding make for a perfect, calm backdrop, and my makes my subjects really stand out. If I am not thrilled witht the backdrop, I can always crop the photo in really tight, and just get the subject, with virtually no bacground showing. Speaking of cropping, the first thing I do with posed-people-pictures is crop them. I typically crop them to be 8 by 10 constraints, so if I want to get them printed (I always use Walgreens, because I can send them online and they are done in an hour, but you can use a home printer, or whatever...) they will fit nicely in a frame. Once I crop the photo, I usually sharpen it up. Then, sometimes I change the finish. Here is the same photo from up top there, but in an antique finish. Back to what I was talking about...photographing posed people. Black and white is another nice way to go. I have ony black and white photos in my cubical at work, and I love the artsy look of them. Lastly, I take a ton of photos when I am trying to capture something. More is more in this case. The beauty of digital cameras is that you can take 300 pictures, and while you may only end up with five good shots, you aren't out a dime. Just delete the bad shots and move on. So, there you have it. Photo tips from someone that isn't a pro, but still manages to snag a few great shots. 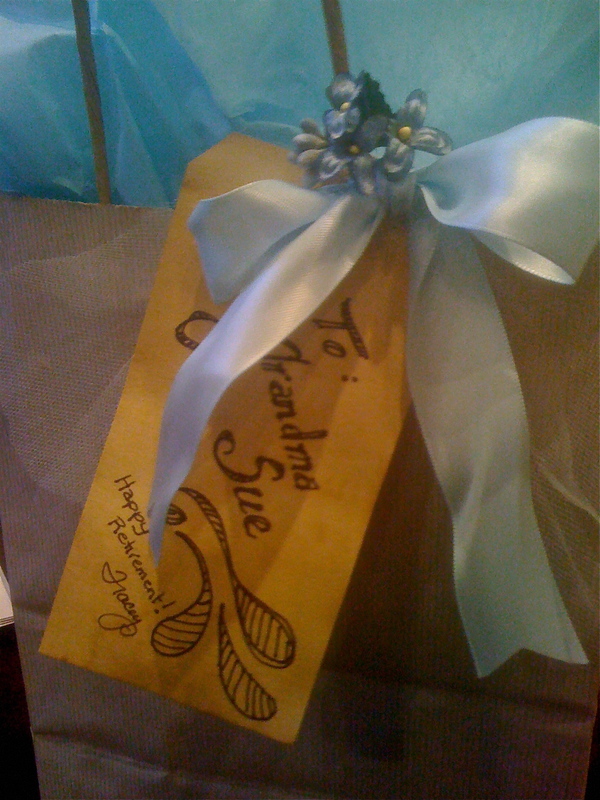 Super fast and easy charming gift wrap job. I love fancy packages with beautiful gift wraps and ribbons and bows, but I have whittled down all of my gift wrap supplies these days. (smaller homes require creative thinking and more sensible purchases...) These days I have opted to go with a more neutral wrap job that can be changed with the color of tissue and the style of gift tag. I now use only brown craft paper (the kind you buy to mail packages in...) and I have a stash of two sizes of an oatmeal colored handled gift bag. 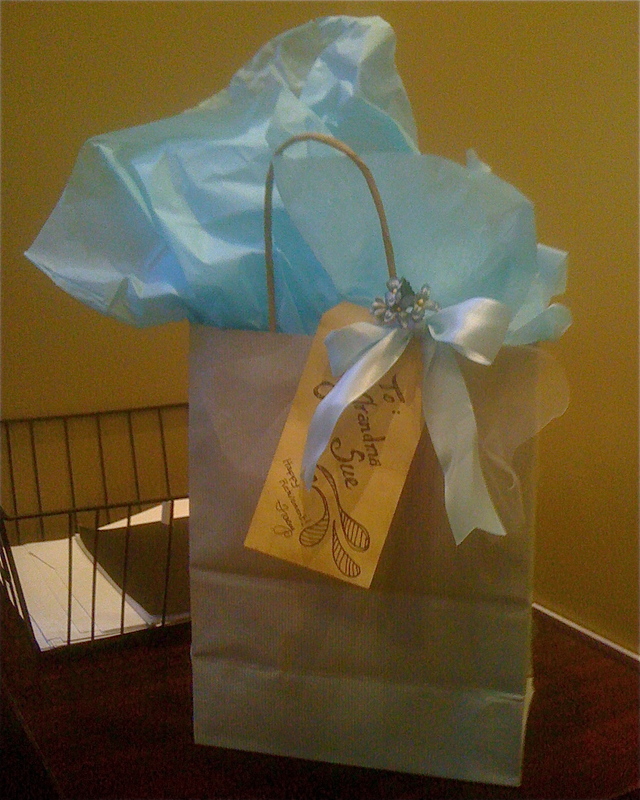 Yesterday I bagged up a gift for a friend that is retiring, and I wanted something charming and simple, but vintage looking and pretty. I got it all in about four minutes time. A bit of tulle, a strip of pale Robin's egg blue ribbon (My favorite! So yummy!) and a hand written (with a fine point black marker)tea dyed manilla tag (I actually dye them in large quantities in a tub of uber hot instant coffee, and let them air dry on cake cooling racks.) Some matching blue tissue and a little sprig of milnery flowers from my collection finished it off. If you keep your wrap supplies simple, and organized, it will be a snap to make any present look like a million bucks, and will make your recipient feel oh-so-special. Everything in it's place and a place for every thing. 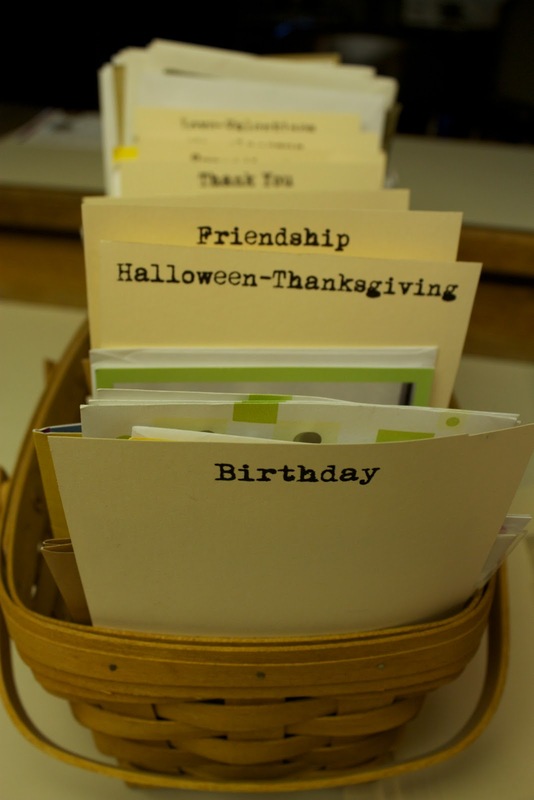 I think a long time ago I shared with you that I collect greeting cards when I find ones I like, and I store them in a lil' basket so I am ready at a moments notice with the perfect card for the right person,at just the right time... but I never actually showed it to you. It started years ago with me accumulating a few extra cards...and a few more...and...well, at some point in time I realized I had so many cards that I needed to actually file them by event, so I could find them as I needed them. You know, birthdays, Christmas, Blank, etc... and that has worked really well for me. When ever I see a card I like, I buy it and put it in my card file so I will have it when I need it. Over time, I have gotten sloppy, rushing in and plopping the latest cards into the front of the basket, thinking I'd put it in the correct category it later. 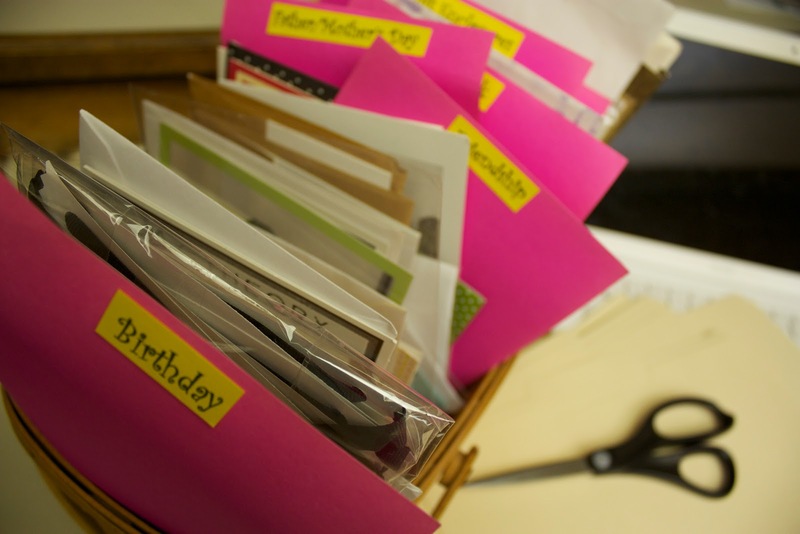 After doing this a million and six a few times, I managed to create a pretty unorganized basket of cards. Something needed to be done, and I decided that today was that day. I decided to go with a simple look, using my favorite old typewriter font. I printed my dividers on manilla folders that I cut to be the size of a sheet of computer paper. All I did was set up 2 columns in WORD, and printed my paper in "Landscape". I cut the paper in half once it was printed and I was ready to put them in place. Within a few minutes I was back to being organized, and it all looked clean, tidy, and cute. Now, let's see if I can keep it this way. We decided to give the same treatment to her cute little bathroom window. as well as one last nail up top in the center, then we folded the runner in half, length wise, and hung it from the center nail..
then pulled the runner fairly taunt and hung it from either end on the outer nails..
We fluffed the ends of the runner so it hung neatly and we were finished. It added a pretty touch to her cute window, and still let plenty of light in. If you're looking for a quick valance treatment for a kitchen, bath or mudroom, you might want to consider your own version of this treatment idea yourself! A few well chosen words. When you're entertaining, it's the littlest details that make things memorable. One of my favorite never-fail little details is so easy that I thought I'd share it here today. Whenever I am entertaining (or giving a gift, for that matter...) I google quotations for the event, or the person. For this past event I googled up love and engagement quotations. I found several that I liked, so I copied them in a simple font (courier) and printed them on a checkered background from my cheesy lil' print program. It adds a bit of interest as well as color to the table, don't you think? It works just as well on gift tags, so remember this next time you are hosting a party or wrapping a package! Birthday decorations that won't break the bank, but WILL look like a million bucks. Three birthdays within seven days,(One of my dearest friends from the biggest little city who coincidentally was up for a visit, my rock n' roll buddy, and my first born daughter!) and I wanted everyone's birthday to be special for them. You know, birthdays only come once a year, so they should be special. With a little thought, some scraps of paper and a little time, I had created lots of little touches that made the birthday clebrations fun. I thought I'd share them with you so that if you feel so inclined, you can make someone's day special too. First of all, I made a fabulous Beatle inspired "You say it's your BIRTHDAY" banner that worked for all three of my birthday people. Oh, yes. The fabulous lil' button adorned flag made the rice crispy treats a hit, taking them from ordinary to extraordinary! Stay tuned...Monday I'll share a few more birthday ideas! Before and after....70's maple night stands get new life in 2011. Oh, the wonders a girl can work with a little creativity and a splash of paint. I found two matching 70's maple night tables at a thrift store a few weeks ago. They were in great working condition, but they looked out dated and the tops were scratched. I removed the pulls, then primed the drawers and body. Two coats of paint (because I was doing a charcoal black shade, mainly.)Viola'! Reborn with a basic Pottery Barn look...all set to re-invent someone's bedroom, and it cost less than $25 to do both night tables, start to finish, including my purchase price of $12 per night table. You just can't beat that. When life gives you lemonade, make a really cool vase. Have you seen the pretty shaped bottles of lemonade they sell at a lot of grocery stores these days? My daughter had them at the baby shower she hosted last month, so I snagged a couple of them, and I was glad I did. They have such a pretty shape,and there was an indention for the label, which made it so easy to trace by pressing a piece of vintage sheet music over the area, and tracing it. I then cut it out and glued it in place with a simple glue stick. I added a vintage skeleton key and some ribbon around the top of the bottle neck and it was done. Perfect for serving water at a meal, or using as a fabulously charming bud vase, don'tcha think? And...best of all, it was a totally free craft project. Monkeying around with my favorite gift box, but with a different twist....er...bow. and glued it on top of a ribbon going across the top of the box (I used my glue gun to secure the wired ribbon). I then glued a second ribbon to the botom of the box and tied tow bows this time, one on each side..... I added a little personalized statement to complete the box top's look....and of course I put something in the file pull. These boxes are just my latest most favorite thing (and I can't get over how classic the black always looks!) for doin' up presents, 'coz the possibilities are endless for the themes you can create, and they are so nice and sturdy. An added plus is that your recipient can then use the box for something else later...and think of you each time they look at it. A new lil' Cottage Industry tutorial blog. You all know that old book pages and sheet music are part of my signature look, and have endured seeing countless projects done this way. Well, the other day, I was over at Carter's home helping his Mama to add some book pages to an old book case for the home office in her new home, and she had the fabulous idea to film me for a nice little tutorial to share with you. C. I was caught in a typical Pacific Northwest (I still can't really believe I live here, can you?!) downpour before going to Carter's home and it made the bad hair day oh-so-much-worse. Oh, one more thing...I have a fair amount of kind of...pauses....and I do not usually talk this way (any, I don't think I do) but, I was trying to get my thoughts together, and there was a bit of a race for time, as we could hear Carter on the baby monitor, stirring from his nap, and time was of the essence. Well, there are quite a few new projects going on between all three of our homes, and I just had to share the latest project over at Mr. C's home. 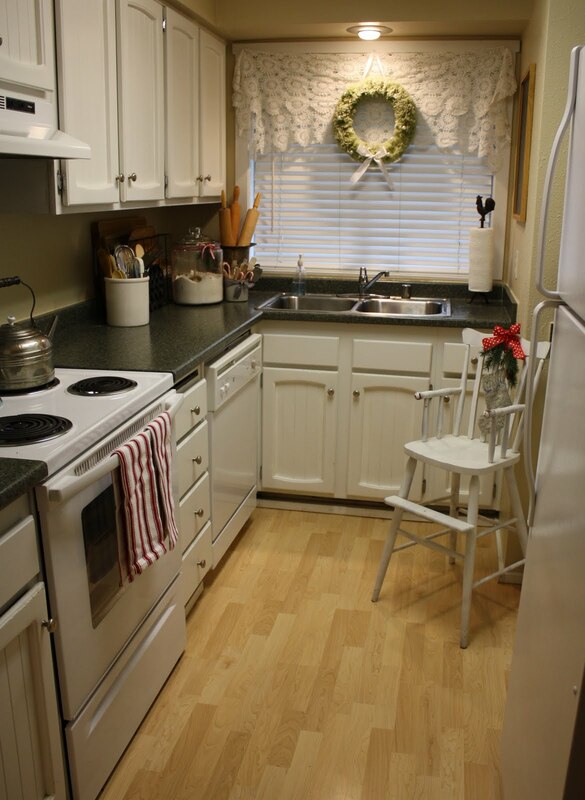 There is a small bedroom just off of the kitchen that was used as a playroom for the last family that lived here, and Mr. C's mama decided to continue using the room that way. It makes perfect sense, really. This way, Carter can walk in and play while his Mama is in the kitchen and it's easy to keep an eye on him..or join him! Old shutters that we found at the salvage yard completed the vintage details for the playroom. (which was a bit of a challenge when all of today's toys are incredibly bright and plastic!) Once Carter is a little bit older, we may add a curtain on a tension rod to the closet to create a puppet theater, but for now, the closet is crammed full of toys. I am not sure exactly who likes the playroom more, Carter, or us girls! New Year's party hat how-to's. I was really surprised at how many of you emailed me with questions on how I made my party hat, so I decided to share the instructions right here. It's very nearly New Year's, so you'll have to get right on this if you want to use it this year. Otherwise, you've got plenty of time if you are thinking ahead for next year's New Year's eve. Oh, one more thing. Keep in mind that the instructions will work for any kind of party hat, not simply New Year's, so think outside of the box here. garland edging if the hat doesn't already have some on it. Pour liquid starch in a large bowl and tear paper of your choice into strips of various sizes. Dip paper in liquid starch and scrape off excess starch with your fingers as you pull it out of the liquid. Drape sloppy wet paper onto hat at any angle you like until the hat is fully covered with the torn pages. Add adornments with a hot glue gun. I'd love to see pictures of your hat and so would everyone else, so please send me a picture when you get yours completed and I will add it to this post with a link to you! Each week I get questions from readers on how to paint vintage furniture; techniques, tips and how to's, as well as paint recipes. Well, if you're anywhere near the biggest little city, I'm excited to tell you that I will be teaching another "hands-on" workshop with all of the hints and tricks to get you inspired and painting! That's right, attendees will be creating their very own take away project... we'll learn all the tips and tricks for priming, painting and antiquing furniture, accessories or cabinets. We'll practice it all on framed chalkboards to take home, and while we wait for our paint to dry between the steps, I'll be sharing more information and tips. The workshop will be held next Wednesday evening from 6-8 pm at the Pickled Tink Studio. You can sign up right on their website, or email them to register!